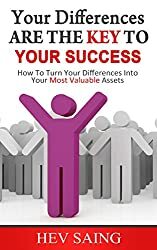 Your Differences ARE THE KEY TO YOUR SUCCESS: How To Turn Your Differences Into Your Most Valuable Assets. Hev Saing is a young professional turned author and public speaker. He began his early life in Cambodia, and later immigrated to the United States. When you read his book, you will learn that Hev had experienced tragedy and hardship at very young age. Despite what life threw at this young man he earned a degree architecture in Cambodia, and a graduate to degree at Boston University. Hev’s book teaches on how find an follow our passion. Today Hev is an author and speaker making a huge contribution and inspiring many! !